Bold Men. Daring Women. Sensual Romance. My novella, RELENTLESS LORD, is now up at Samhain Publishing! This is a prelude to my other Samhain titles (ROGUE COUNTESS, RECKLESS VISCOUNT, REBEL MARQUESS) and takes place one hot summer at a country party where the guests are not always what they seem and seduction tends to run as a theme. Expect a fun (and steamy) summer read with this one! RELENTLESS LORD is available for pre-order July 12, 2015. Official release is August 11, 2015. For now… a brief description to tempt the appetite. He is a hunter at heart…but her heart is no easy prey. Hannah Walpole suspected the etiquette lessons her parents insisted upon were a wasted effort. Now, looking around at the ton at her debut, she’s sure of it. Her home is the African continent. She simply does not fit in English Society. Nothing will convince her otherwise, especially not a devilishly handsome lord with black hair, vivid green eyes and a wicked reputation for debauching innocent young women. Lord Miles Whitely admires Hannah’s adventurous spirit and cool composure in the face of adversity. It doesn’t hurt that their first encounter provides him with the delightful opportunity to get his hands beneath her skirts. Contains one misfit debutante, one shamelessly flirty rake who finds humor in nearly everything, and a long, hot summer party in the country. Deploy your fans, ladies. Things are about to get steamy. Not long ago, at this time of day, the sun would still be sleeping and my house would be quiet and dark. Not any more. The sun rises before me these days. And somehow that changes the energy of my day. My morning writing time feels more rushed, as though any minute a little one will wander downstairs all sleepy and grouchy at having to get ready for school. In truth, I have almost an hour before I should expect any significant interruptions. But I am still distracted. After today, there will be only two more weeks of school left and then the energy of our whole household will change. Everyone (except me) will sleep in a little later and wake up knowing there is absolutely nothing they need to get ready for. My DH, also a full-time student, finished his last final exam of the semester on Tuesday. Very soon his days will be spent out in the back yard, keeping an eye on the kids, and soaking up the summer sunshine and blue skies. Oh, and potty training our youngest. It won’t be much longer until we are diaper free! My routine, however, remains the same. Get up early. Write. Go to work. Come home. Try to enjoy as much of the nice weather as possible. Still, it feels different. Hibernation season is over up here in the Northwoods. Late spring (because early spring is still just to cold) and summer are for getting out and about, seeing friends, going to concerts in the park, taking long walks with the kids and short jaunts to West Side Tasty Treat for ice cream after dinner. 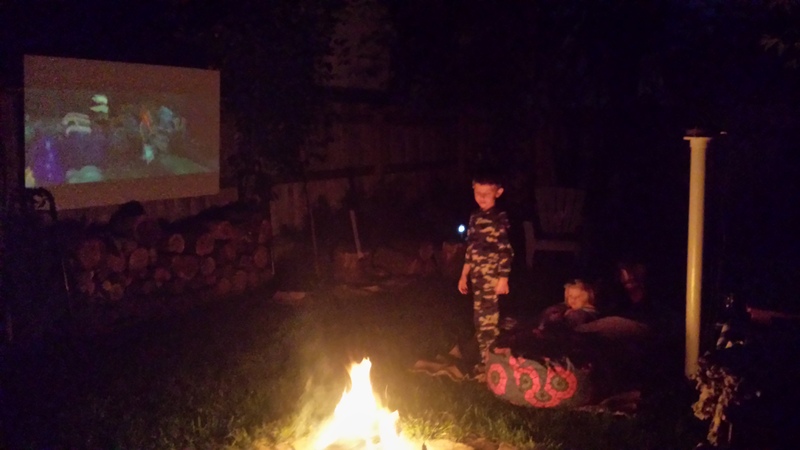 Summer is for late nights by the campfire or movie nights on the big projection screen my DH made for outside. A bit more difficult to remember is that it’s also a time for writing. I am about a third of the way into the first draft of book three in a series scheduled to release next year. I am so excited about this series and with the first two books already turned in to my editor, this last one will carry me through the summer and fall. The heroine in this third book is a feisty little thing who demands adventure and simply will not allow me to leave her dawdling for any length of time, which is a good thing with all these summer distractions. Which reminds me…I had better get back to her before I hear little feet padding down the stairs. Here’s to the long days of summer. Movie night in the back yard. Would you like to get news on what Amy is up to? Romance sprinkled with a dash of suspense, a pinch of seriousness, and a smidgen of humor.